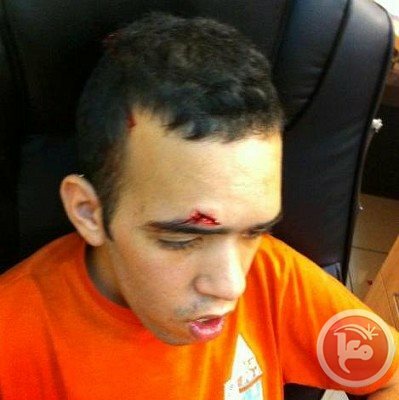 An 18-year-old with special needs suffered serious injuries after a group of extremist Israelis assaulted him while was outside his house in the Old City, the Palestinian prisoners society said. Nasser Qawes, the director of PPS office in Jerusalem, said that the group assaulted Hussein Jaber while he was with his friend near the Iron Gate, using stones to assault him. 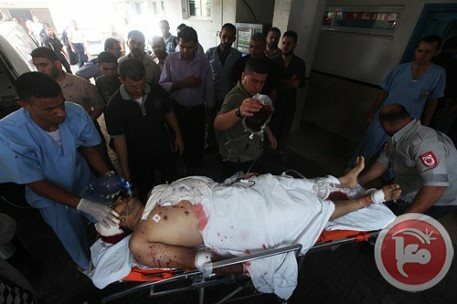 Jaber lost consciousness and suffered injuries to the head. Israeli police detained two of the suspects, leading to clashes with other Israelis. 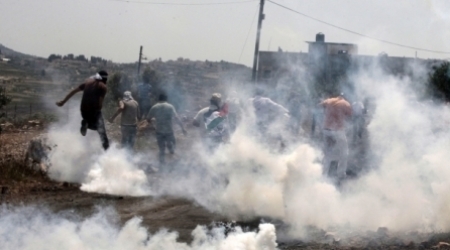 More than ten Palestinians were injured, while dozens of suffocation cases were reported in Beitunia southern Ramallah on Friday evening, after Israeli occupation forces (IOF) fired rubbers bullets and teargas bombs on inhabitants. 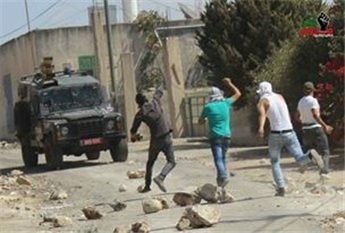 The PIC reporter said that two Israeli soldiers sustained minor injuries when young men threw stones at them in the clashes that erupted after IOF troops stormed the Old City of the village. Dozens of Palestinian youths had earlier marched towards Ofer prison protesting the Israeli forces and settlers' break-ins into al-Aqsa mosque. They were also marking the Sabra and Shatila massacre. IOF soldiers chased the Palestinian youths into the Old City in Beitunia where the violent clashes were reported. 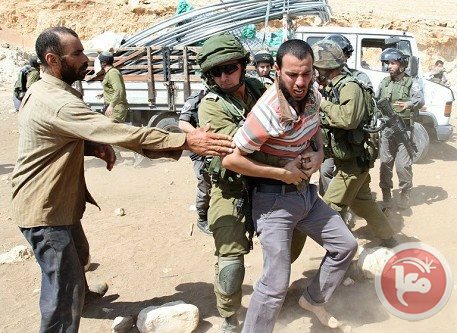 Israeli media sources reported Friday [September 20, 2013] that a Palestinian youth was kidnapped by Israeli soldiers at a roadblock in the northern part of the West Bank allegedly after attempting to stab a soldier. 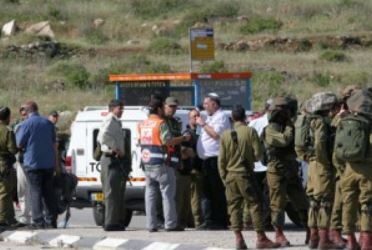 The sources said that the youth “carried a big knife” and attempted to stab one of the soldiers manning the roadblock. According to the report, the soldiers managed to stop the attack, and arrested the Palestinian before taking him to a military base for interrogation. On Friday afternoon, at least 10 Palestinians were injured when Israeli soldiers used excessive force against the weekly nonviolent protests against the Apartheid Wall and illegal settlements in different parts of the West Bank. Dozens of nonviolent protesters have been treated for the effects of teargas inhalation. Israeli soldiers violently attacked international diplomats, and prevented dozens of residents from rebuilding the destroyed Khirbit Makhoul village, in the West Bank’s Northern Plains. The visiting diplomats came from France, Britain, Ireland, Spain and Australia, including diplomats of the European Union’s political bureau, who tried to render aid to the displaced impoverished villages of Makhoul village that was displaced three times. 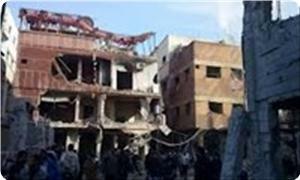 The army also declared the area a closed military zone, preventing the residents and internationals from entering it. Khirbit Makhoul small Bedouin village was destroyed on Thursday for the third time in a row, leading to the displacement of dozens of families. Israeli troops have used force to disperse a group of European diplomats, who attempted to hand out tents to Palestinian Bedouins. The diplomats were accompanying aid workers in an effort to distribute tents and emergency aid to Bedouins in the village of Khirbet Al-Makhul on Friday. The troops threw sound grenades at the group and pulled a French diplomat out of an aid truck before it drove away. 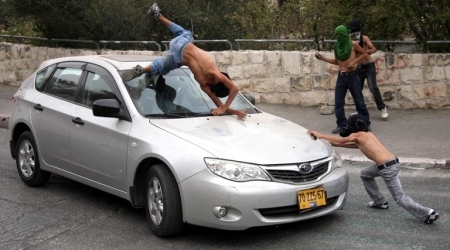 Three Palestinians were also arrested for throwing stones. According to an unnamed source, diplomats from France, Britain, Greece, Ireland, Spain, and Sweden were accompanying aid workers. “It’s shocking and outrageous. We will report these actions to our governments,” said one EU diplomat on condition of anonymity in reference to the Israeli troops’ thwarting of the humanitarian efforts. PLO official Hanan Ashrawi on Friday strongly condemned an attack by Israeli forces on foreign diplomats distributing aid to Bedouins in the Jordan Valley. Israeli troops used force to disperse a group of foreign diplomats, who had accompanied aid workers to the village of Makhul in the Jordan Valley, an AFP photographer said. French diplomat Marion Fesneau-Castaing was dragged out of an aid truck, the photographer said. A European diplomatic source said the woman was yanked out of the truck by Israeli soldiers who later confiscated the vehicle. The source, who declined to be named, said diplomats from France, Britain, Greece, Ireland, Spain and Sweden had accompanied aid workers to Makhul to help hand out tents to the Bedouins. "On behalf of the Palestinian leadership, I condemn in the strongest terms the brutal attack on your representative's person and dignity by the Israeli occupation forces," Hanan Ashrawi said. "This measure is yet another example of the Israeli policies that aim at preventing any attempt to ease the suffering of the Palestinian people, let alone ending the occupation," she added. The assault was a violation of the Vienna Convention on Diplomatic Relations and amounts to "bullying" of the international community, the senior PLO official said. "This is a sample of what the Palestinian people has been subjected to since the beginning of the occupation," she added. An army spokeswoman said forces were implementing a supreme court decision and "contained the violence with riot dispersal means and detained Palestinians who were the main instigators." On Monday, Israel's army demolished property built by Bedouins in Makhul, after an Israeli court ruled they had been erected without building permits and declared the area a "closed military zone". The move forcibly displacement 10 families, including 16 children, the UN's Office for the Coordination of Humanitarian Affairs said. The UN's humanitarian coordinator James Rawley expressed "deep concern" over Friday's incident and the demolitions that evicted Palestinians from their property. "The United Nations and its partners remain committed to providing humanitarian assistance to populations in immediate need," Rawley said, after Israeli troops prevented the distribution of aid. "I call upon the Israeli authorities to live up to their obligations as occupying power to protect those communities under their responsibility, including to halt demolitions of Palestinian homes and property," he added. "The displacement of a whole Palestinian community in the occupied Palestinian territory is a very disappointing development at such a delicate moment where we look forward to positive measures on the ground," he said in reference to the resumption in July of Palestinian-Israeli peace talks. Palestinian medical sources said two Palestinians were shot and injured as Israeli army fired towards them east of Jabalia, a northern refugee camp of the Gaza Strip. The injured were in their farmlands, close to the border fence east of Jabalia, the source reported. They suffered mild injuries and were moved to Kamal Adwan Hospital, in northern Gaza. The incident is one of in a record of Israeli attacks on the Gaza farmers and villagers that take place any time they approach the border while working in their lands. Israeli army also repeatedly conduct limited incursions into border areas, uproot farmlands and trees, and destroy property. On Thursday morning, an Israeli special force kidnapped two Palestinians allegedly tried to cross the border fence, in the Juhr Ad-Deek area, in central Gaza. Moreover, soldiers sporadically fired live ammunition into the Al-Bureij refugee camp, in central Gaza Strip, with no injuries reported. Eyewitnesses said that the military towers stationed along the border targeted a number of homes and farmlands. Palestinian medical sources reported that two Palestinian youths have been shot and injured by Israeli army fire east of Jabalia, in the northern part of the Gaza Strip. 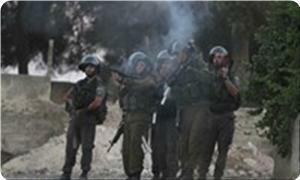 The sources said that the two youths were in Palestinian farmlands, close to the border fence east of Jabalia. They suffered mild injuries and were moved to Kamal Adwan Hospital, in northern Gaza. Israeli soldiers repeatedly attack Palestinian farmers and villagers any time they approach the border fence while working in their lands. Soldiers also conduct various limited invasions into border areas, uproot farmlands and trees, and destroy property. 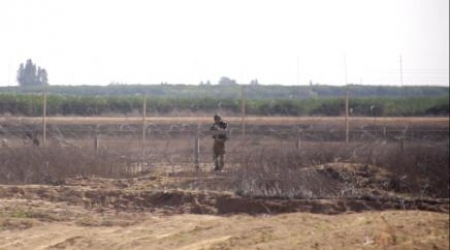 On Thursday morning, soldiers kidnapped two Palestinians allegedly after they tried to cross the border fence, in the Juhr Ad-Deek area, in central Gaza. Also on Thursday, soldiers fired several rounds of live ammunition into the Al-Boreij refugee camp, in central Gaza, causing damage but no injuries. Eyewitnesses said that the rounds came from military towers across the border, near Al-Boreij, and targeted a number of homes and farmlands. 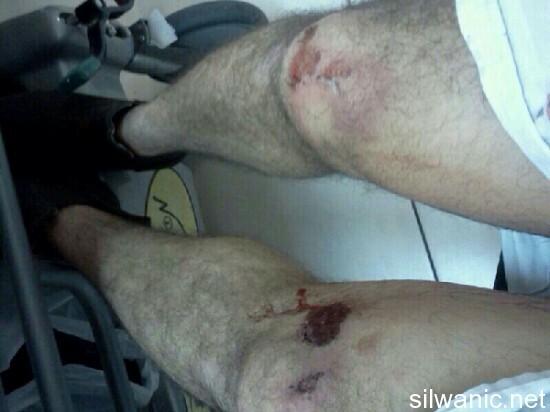 Hisham Saleh Abbasi, a 28-year old young man from Silwan, was injured with bruises and wounds when a settler’s car collided with his motorbike in Silwan. Abbasi explained that he was driving his motorbike near Dung gate in Silwan when he faced heavy traffic and decided to drive by it and pass it. The settler who was driving a white Renault car also decided to drive by the traffic and pass it and that’s when he hit Hisham. He pointed out that he suffered deep cuts in his face and had stitches in different parts of it, in addition to injuries in both of his legs. AIPAC To Obama, Rouhani: WE WILL HAVE OUR WAR! Here is AIPAC’s official response [PDF] to the growing possibility that Iran and the United States will negotiate to reach an agreement on the nuclear issue, It can be summed up in three words: NO, NO, NO. Netanyahu and his lobby want war and, suddenly, they fear they won’t get it. It’s like Dickens wrote: it was the worst of times and it was the worst of times. 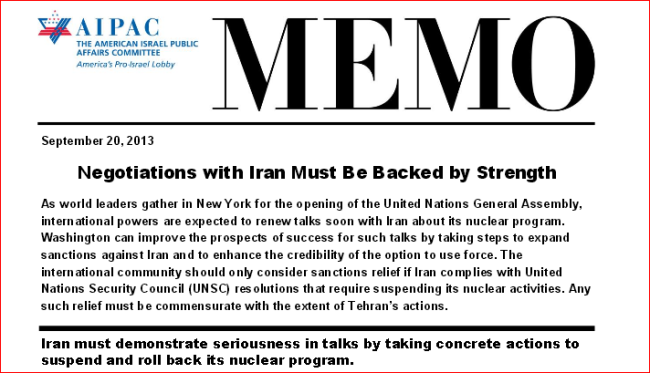 I think I will read AIPAC’s memo [PDF] again over Shabbat dinner. Seeing them in pain is, in itself, a blessing. 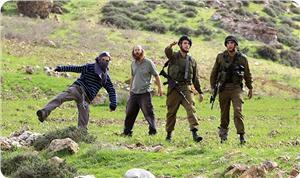 Hundreds of settlers stormed on Friday morning the Sulaiman’s Pools area south of Bethlehem, and Khallet Fahm and Bir Haram al-Rami, in the city of al-Khalil in the southern occupied West Bank and performed Talmudic rituals there. 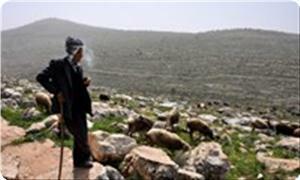 Local sources said that about 300 settlers stormed the area of Sulaiman's Pools through the road of Efrat settlement. 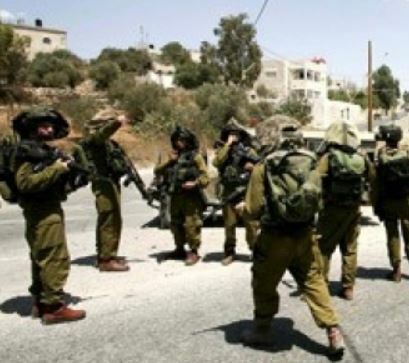 The sources pointed out that the settlers performed during the raid Talmudic rituals in the area under the protection of the occupation forces, and then they withdrew towards the nearby outpost of Umm Hamadein. They added that the occupation army turned the area of Khallet Fahm, south of the town of Khader, into military barracks and set up checkpoints to prevent the citizens from reaching the area and to enable the settlers to organize celebrations of the Sukkot. The sources said that dozens of settlers also raided Bir Haram al-Rami in the city of al-Khalil, and performed Talmudic rituals there, before withdrawing to the nearby settlements built on Palestinian lands. 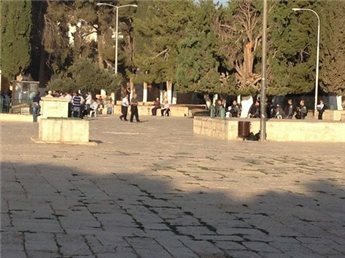 Meanwhile, a group of Jewish extremists attacked two young Jerusalemites while they were in front of their house at Bab El Hadid in Jerusalem, causing one of them, Hussein Jaber, aged 18, ​​wounds and bruises in the head, chest and back, Nasser Qaws Director of Prisoners' Society in Jerusalem said in a press statement. He noted that clashes broke out between the Jewish extremists and the Palestinian youths after the attack on Jaber, and added that the Israeli police arrived to the scene and arrested two Israelis. Clashes broke out between Palestinians and Israeli soldiers on Friday in the small village of Makhoul, a small Palestinian village demolished by Israel days earlier. A number of Palestinians suffered tear-gas inhalation while two were hit with rubber-coated bullets, locals said. Israel declared the area a closed military zone. Reuters reported that Israeli forces also assaulted foreign diplomats who were attempting to deliver emergency aid to the stranded residents. On Wednesday, Israeli forces seized tents set up by the residents. Aref Daraghmeh, the mayor of al-Malih and al-Madarib villages, told Ma'an that Red Cross workers were still distributing tents to people when a large Israeli military force raided the site, knocked down tents and confiscated them. Daraghmeh added that Israeli soldiers were “brutal and barbaric” in dealing with Palestinians, which led to clashes between soldiers and those who refused to abide to Israeli orders and stayed in their tents. 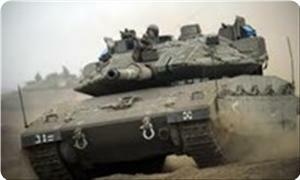 Two people were shot and injured by Israeli forces on Friday in the northern Gaza Strip, witnesses said. Israeli forces in a watchtower north of Beit Lahiya shot at people walking in the area, injuring two, the witnesses said. Medics said that one person was shot in the foot while another was shot in the thigh. Both suffered moderate injuries. An Israeli army spokeswoman said soldiers opened fire after several Palestinians approached a security fence and hurled rocks in an attempt to damage it. She said soldiers first fired warning shots to disperse the scene and later fired at the Palestinians when they refused to respond. She said two hits were identified. On Wednesday, 18 September 2013, a Palestinian fisherman was injured and consequently one of his fingers was amputated when Israeli naval troops opened fire at Palestinian fishing boat on board of which 5 fishermen were sailing nearly 6 nautical miles off Gaza Harbor, The Palestinian Center for Human Rights (PCHR) said in a press statement Thursday. PCHR condemns the continuation of Israeli forces' attacks against Palestinian fishermen in the Gaza Strip and expresses deep concern over violations of fishermen's right to work freely in Gaza sea. According to investigation conducted by PCHR, at approximately 14:30 on Wednesday, 18 September 2013, a Palestinian fishing boat sailed from Gaza Harbor. Five fishermen were on board the boat. At approximately 16:30, the boat arrived at a point in the sea nearly 6 nautical miles of the shore. One of the fishermen, Ayman Ahmed Tulba, stated to a PCHR field worker that he and the other four fishermen threw their fishing nets into the water. Soon, they were surprised by an Israeli gunboat coming towards them. 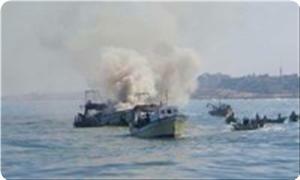 Israeli soldier opened fire at the fishing boat without any warning. Tulba added that the fishermen were extremely terrified and attempted to escape. The fishermen moved to the back of the boat. In the meantime, a bullet hit a lever that is used to pull fishing equipment, so its belt fell onto one of the fishermen, Saleem Khalil al-Fassih, 56, injuring him in the fingers of his right hand. 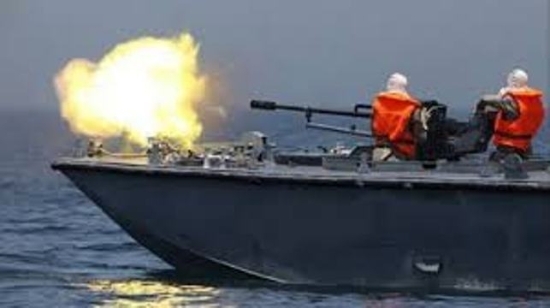 Al-Fassih stated to PCHR that the Israeli naval troop continued to fire at the boat although it moved back up 4 nautical miles off the shore. The fishermen then called the Palestinian naval forces, and al-Fassih was evacuated to Shifa Hospital in Gaza, where doctors were forced to amputate one of his fingers. Al Fassih is still in need for a surgery. 3. Calls upon the international community, including the High Contracting Parties to the Fourth Geneva Convention of 1949 Relative to the Protection of Civilian Persons in Time of war, to intervene immediately to stop the Israeli violations against the Palestinian fishermen, and to allow them to sail and fish freely in the Gaza sea. Jewish settlers opened fire at Palestinian shepherds near Itamar settlement to the south east of Nablus city on Thursday morning. Ghassan Daghlas, in charge of monitoring settlement activity north of the West Bank, said that the settlers fired at the shepherds, who came from Khirbat Yanun near Aqraba village, to force them keep away from Duwaya area, which is adjacent to the settlement. He said that the shepherds believe that settlers were responsible for poisoning 40 of their sheep a few days ago by pouring poison into a water spring where the sheep drink. The Israeli occupation forces (IOF) physically assaulted three young men and kidnapped one of them after intercepting them at Zatara checkpoint, south of Nablus city. The Palestinian prisoner society said that the IOF at Zatara checkpoint brutally beat Wajdi Shalabi, 21, and two of his friends before taking him prisoner on Wednesday morning . The society affirmed that the soldiers forced the three young men to undress for search and tried to harass Shalabi, adding that the provocative acts of the soldiers prompted the young men to try to resist their detention. It also said that the soldiers subdued, beat and verbally abused the young men before they released two of them and detained Shalabi. An Israeli channel had claimed that the Israeli police arrested a Palestinian young man, from Askar refugee camp in Nablus, near Zatara checkpoint, after they found a pistol and a knife in his possession. The channel also claimed that the young man tried to stab one of the soldiers, adding that he was interrogated and confessed to his intention to carry out an operation against Israeli soldiers. In a separate incident, a group of Palestinian young men on Wednesday evening ambushed two Israeli military vehicles carrying soldiers at the entrance to Al-Fawwar refugee camp, south of Al-Khalil city. According to the Palestinian information center (PIC) reporter, the Israeli vehicles were heading towards Hagai checkpoint when the young men came out of nowhere and showered them with a hail of stones. The soldiers aboard the vehicles responded immediately to the young men and started to open live fire at them before chasing them into the groves near the main road. No arrests were reported. 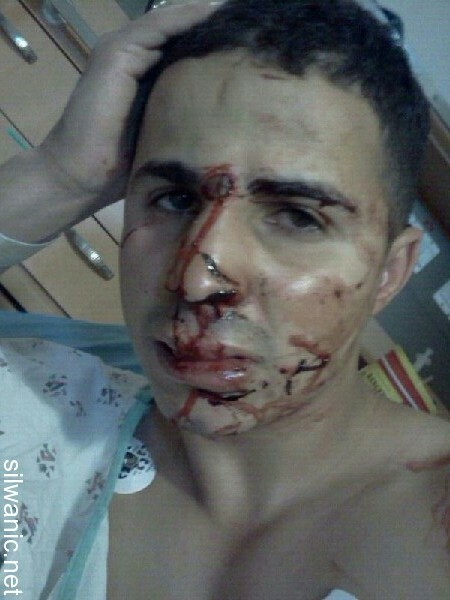 Al-Fawwar refugee camp has seen lately sporadic clashes between Palestinian young men and Israeli soldiers. Israeli Occupation Forces raided an area to the east of Joher Dik town southern Gaza Strip on Thursday morning. Israeli armored vehicles, including bulldozers and tanks, pushed into Joher Dik town and moved in 300 meters along the borderline, eyewitnesses said. The Israeli vehicles opened fire indiscriminately on the agricultural lands of the Palestinian citizens in order to force them to leave their lands. No injuries were reported. 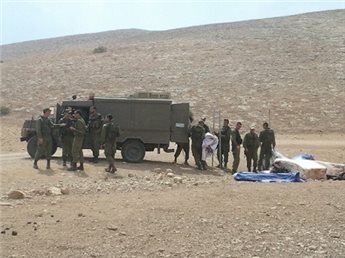 The sources added that the Israeli military conducted combing and leveling operations. 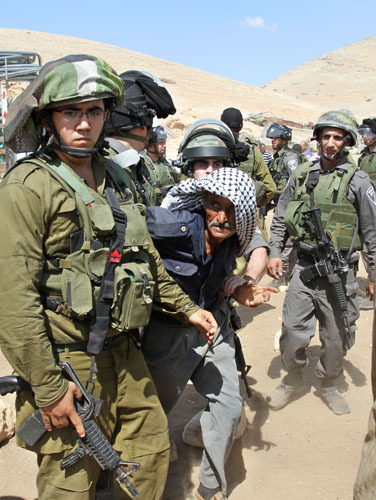 The IOF soldiers carry out almost daily violations to the Egypt-brokered calm agreement between the Palestinian resistance and Israeli occupation following November 2012 offensive. The Israeli army break-in came in the context of Jewish holidays. It marks one in a string of measures carried out during such occasions, purportedly to secure a safe entry of Israeli settlers into Ibrahimi Mosque, a part of which is specified for Jews following Hebron massacre. He added "the officers told me that there is a decision to occupy my house as from 17 to 24 of September,"
The Israeli government divided Ibrahimi Mosque in two after shooting spree committed by Israeli settler Baruch Goldstein on the 15th of the Holy Month of Ramadan 1414 (February 1994) left 29 Palestinian Muslims dead and scores injured. 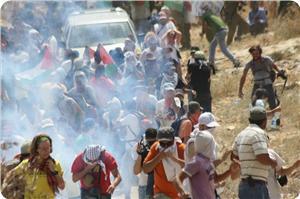 The popular rage in the streets and the stand-off with the Israeli occupation army resulted in a further 35 deaths. The Israeli authorities also set up lots of checkpoints on the ways leading to the Ibrahimi Mosque in order to impose a de facto for Palestinians so that the holy site would not be visited by them. A 6-year-old little child was injured on Thursday after being run over by a settler's car in Hebron in the south of West Bank, witnesses said. According to Palestinian Security sources, Jinan Makram Al- Rugby was seriously wounded and moved to Al-Khalil Governmental Hospital where she received treatment. The medical sources said that she sustained moderate injuries and bruises in her body. The Israeli troops imposed restricted security measures on the military checkpoints in Hebron including Halhoul and Jouret Bahlas added to the main entrances in the district. The Israeli soldiers from time to time intentionally conducted searching campaign on the Palestinian vehicles which lined at the military checkpoints. An Israeli settler ran over a Palestinian child in al-Khalil southern occupied West Bank, causing her various bruises and injuries. The six-year-old girl Jinan Makram Rugby has been injured after being run over by an Israeli settler's car. She was transferred to al-Khalil Governmental Hospital to receive medical treatment. Her injuries and bruises were described as minor to moderate. Israeli occupation forces tightened military measures on the main entrances to al-Khalil where they set-up temporary military checkpoints. Dozens of Palestinian vehicles were stopped and searched on the Israeli checkpoints erected throughout al-Khalil. Meanwhile, an Israeli military force raided the headquarters of Mahd Company for car maintenance where they conducted search operations. On the other hand, violent clashes erupted between Israeli soldiers and Palestinian youths in Fawwara refugee camp south of al-Khalil, where IOF fired sound and tear gas bombs. No injuries were reported. 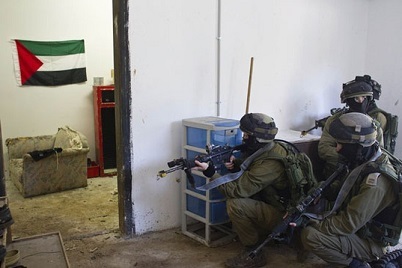 Israeli military forces(IMF) seized on Wednesday evening a Palestinian house close to the Ibrahimi mosque in Hebron. Owner of the house Isssa Abu Mayala said " I went to my home which located near the Ibrahimi mosque in the old city of Hebron but I was shocked when I was prevented from entering it as the Israeli occupation military broke into the house, turning it into a military barrack." He noted that he had rented out his house to the High Judicial Council by a free contract in the presence of a number of judges and the head of the Hebron Rehabilitation Committee(HRC). 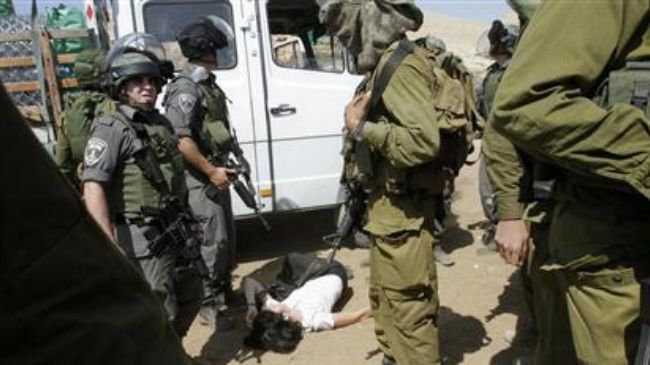 The Popular Committee Against the Wall and Settlements Hebron, in the southern part of the West Bank, has reported that Israeli soldiers kidnapped two Palestinians from the Al-Hadeediyya area, east of Yatta town. Rateb Jabour, Coordinator of the Committee, stated that the soldiers kidnapped Yasser Zakary and Sabha, 45, and Morad Ahmad Abu Oleyyan, 19, after violently breaking into their homes and searching him. The two were cuffed, and blindfolded, before the army took them to an unknown destination. In related news, soldiers kidnapped two Palestinians near Juhr Ed-Deek area, in central Gaza after claiming they tried to infiltrate into Israel. Soldiers also opened fire at the Al-Boreij refugee camp in Gaza, causing no injuries or damages. The assaults are part of ongoing violations, and assaults, carried out by Israeli soldiers in the occupied West Bank, targeting civilians and their property. These attacks are also accompanied by escalating assaults carried out by extremist settler groups. The Israeli forces also arrested three Palestinians; two were identified as Tamer Shalata and Hussain Abu Ghunaim, according to Abu Atta. They closed Al-Aqsa mosque's gates with chains and banned dozens of Palestinians from accessing the mosque. Israeli authorities allowed elders to access the mosque, but banned hundreds of young Palestinians, who prayed instead at the mosque's gates and in its vicinity. The Israeli forces converted the Old City into a military outpost and deployed hundreds of its soldiers within the city and the mosque's surrounding areas. The Israeli Occupation Forces have escalated targeting Palestinian refugee camps in West Bank for political purposes, Tadamun Foundation for human rights said on Wednesday. Ahmed Beitawi, a researcher at the foundation, said that the IOF escalated recently its raid and arrest campaigns against refugee camps aiming at dragging the camps into confrontations. The occupation aims to exploit the possible Palestinian response as an opportunity to achieve internal political victories and to justify its crimes that escalated recently despite talks' resumption, he said. Beitawi added that ten Palestinians from West Bank refugee camps were killed since the beginning of the year, most recently was the martyr Islam Tobasi who was shot dead yesterday. The occupation aims at draining the refugee camps in order to prevent any possible outbreak of a new uprising, he noted. He pointed to Commander of the Israeli Central Command Maj.-Gen. Nitzan Alon's statements, published in Yediot Ahranot Hebrew newspaper, where he warned that "more and more areas in refugee camps in Jenin, Qalandiya and near Nablus were becoming havens for Palestinian terrorists." "They want to limit our operational freedom, and we want to prevent this. We cannot allow a situation whereby the Palestinian terrorists have safe places where they can get organized and use as bases from which they leave to carry out terror attacks," he added. Dozens of Palestinian worshipers at the Aqsa Mosque on Wednesday morning suffered injuries and tear gas suffocation when the Israeli occupation police forces suddenly stormed the courtyard and started to attack them. 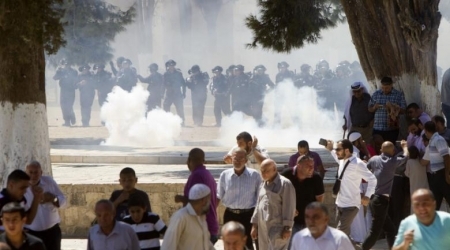 Safa news agency quoted media coordinator for the Aqsa foundation Mahmoud Abul Atta as saying that scores of rapid reaction policemen raided the Aqsa Mosque in the morning and surrounded the Palestinian worshipers in its courtyard and premises. Abul Atta added that the policemen tried to get five Jewish settlers to enter the Mosque compound through Al-Maghariba Gate and when they failed they besieged it, intensified their presence in its courtyard and started to attack the Palestinian worshipers, who kept shouting the protest chants of Allahu Akbar. He also said that the invading policemen attacked the worshipers with batons and sprayed pepper gas at their faces, which rendered many of them injured. He added that despite the ferocious attack, many worshipers held their positions in the courtyard while some others went back to the grey-domed Mosque to defend it from any desecration by the policemen. Abul Atta also affirmed that the police detained one of the worshipers identified as Samer Shala'ita and chained the Gates of the Mosque shut. He warned that the situation was getting increasingly tense at the Mosque and its vicinity as the police tightened their siege and intensified their attacks on the Palestinian worshipers inside. Dozens of Jerusalemite students were injured on Wednesday morning after the Israeli soldiers attacked their school in Abu Dis eastern Jerusalem and fired tear gas on them. 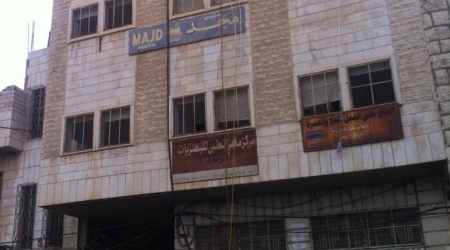 Maisa Abu Ghazalah, a researcher in Wadi Hila Information Center, told Alray that an Israeli special unit attacked Abu Dis town and surrounded “the Abu Dis Male Secondary School” close to Al-Quds University, leading to clashes between the Israeli soldiers and the students. She added the Israeli troops fired tear gas toward the school, several suffocation cases were reported. These attacks came after a group of Israeli settlers stormed Al-Aqsa in the early morning under the pretext of celebrating the Jewish holiday called” Soroka Holiday”. Israeli forces forcibly entered the al-Aqsa mosque compound on Wednesday and deployed heavily around the entrances, preventing Palestinian worshipers from accessing the area, locals said. Israeli troops entered the compound through the Moroccan Gate and the Chain Gate and denied all Palestinians, including women and chidlren, entry to the area. Around 500 students who study at religious schools in the al-Aqsa compound were also denied access to their schools, witnesses said. Meanwhile, a group of ultra-orthodox Jews were allowed entry to the area at around 8 a.m. through the Moroccan Gate. Dozens of Palestinian worshipers who were in the mosque hurled stones at the group, before being chased by Israeli forces. They were then held in the southern mosque and attacked with pepper spray, witnesses said. 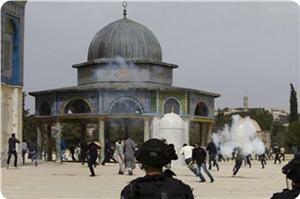 Hundreds of worshipers gathered near the main gates leading to al-Aqsa in protest about restricted access to the area. Israeli officers hit several people, including women, with clubs near the Bab al-Huta. A series of recent of visits by Israeli rightists have created a sense of fear among al-Aqsa authorities about control of the holy site. Head of the Islamic Higher Commission, Sheikh Ekrima Sabri, told Ma'an last week that repeated incursions by Jewish extremists "confirm Israeli ambitions and the risks to the mosque." He pointed to the division of the Ibrahimi mosque in Hebron, which is now separated into two parts. A Palestinian fighter was injured early Wednesday in clashes with Israeli forces in north Gaza, witnesses and medics said. 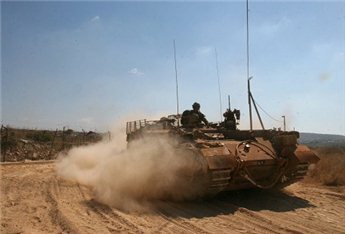 Several Israeli military vehicles and infantry troops crossed into a border area in north Gaza, clashing with fighters stationed in the area. A helicopter provided air cover to the ground forces, witnesses said. It is unclear to which faction the fighter belonged. An Israeli army spokeswoman did not return calls seeking comment about the incursion. Wednesday at dawn [September 18 2013], dozens of Israeli soldiers invaded Yatta town, south of the southern West Bank city of Hebron, broke into and searched several homes, and installed roadblocks in various areas in the Hebron district. 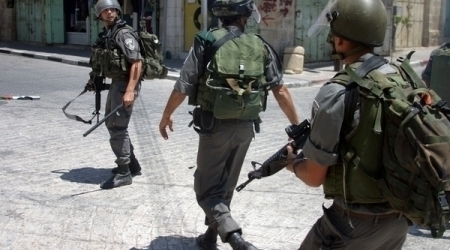 One Palestinian was kidnapped in Nablus. Eyewitnesses said that the soldiers violently searched various homes after breaking into them, and that the searched homes belong to members of the Abu Eqbeita family. Furthermore, the army installed various roadblocks at the entrances of the towns of Halhoul and Sa’ir, the northern entrance of Hebron city, and the Al-Fawwar junction. Local sources said that the soldiers inspected the ID cards of dozens of residents, interrogated them, and searched their vehicles. In related news, dozens of soldiers invaded various neighborhoods in the northern West Bank city of Nablus, broke into and searched several homes before kidnapping one resident. Local sources said that the army kidnapped Mohammad Nayef Daoud, 29, a resident of Ras Al-Ein neighborhood in the city, and took him to an unknown destination. On Tuesday, a Palestinian youth was shot and killed by Israeli soldiers invading his home in the Jenin refugee camp, in the northern West Bank city of Jenin, while dozens of residents have been injured during ensuing clashes, and one was kidnapped. Also on Tuesday, soldiers kidnapped at least nine Palestinians in different parts of the West Bank.